Mitchell Gallery Exhibition Schedule 2004-2005. 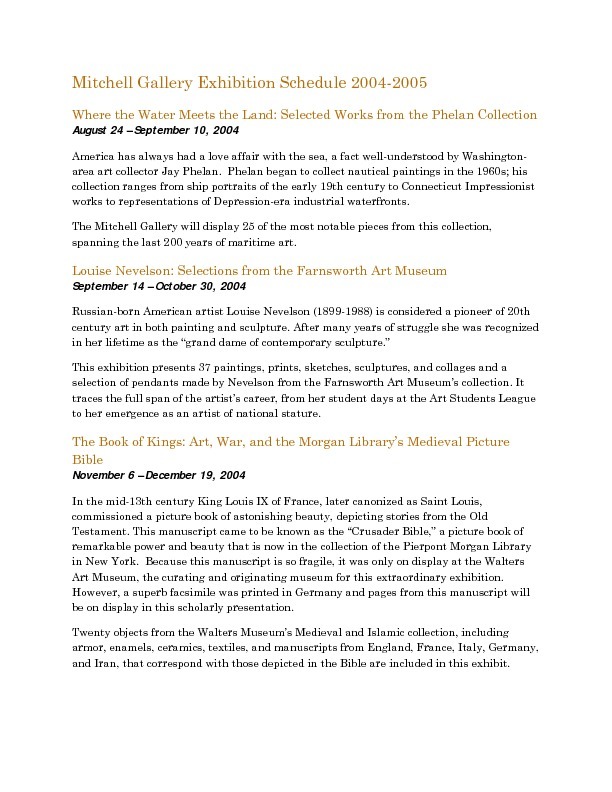 Exhibitions include: Where the Water Meets the Land: Selected Works from the Phelan Collection; Louise Nevelson: Selections from the Farnsworth Art Museum; The Book of Kings: Art, War, and the Morgan Library's Medieval Picture Bible; A Community of Artists: The Collection of the Provincetown Art Association and Museum; Heroes, Villians, and Mermaids: The Fantastical World of Ronald Markman; and St. John's College Community Art Exhibition. Mitchell Art Gallery, “Mitchell Gallery Exhibition Schedule 2004-2005,” St. John's College Digital Archives, accessed April 18, 2019, http://digitalarchives.sjc.edu/items/show/2702.